Bali Mynah; Bearded Barbet; Burrowing Owl; Great Hornbill; Guam Kingfishers; Horned Guan; King Vulture; Red-billed blue Magpie; Rhinoceros Hornbill; Tawny Frogmouths; Toco Toucan and Raptor Exhibits. White-headed Buffalo Weaver, Yellow-billed Hornbill, Carmine Bee-eater, Blacksmith Plover, Superb Starling Exhibit. Last year I was lucky enough to visit one of my favourite zoos which is St Lois Zoo in Missouri , USA. This time around I was privileged to be shown around by Eric Miller who is the Senior Vice President of the Zoo. He was very kind to donate his day to show an Aussie zoo keeper around. He is very proud of his bird department and so he should be. They keep some spectacular species over there that would make any keeper over here quite envious. The St Louis Zoo bird house is something I definitely haven't seen in any of our zoos over here. 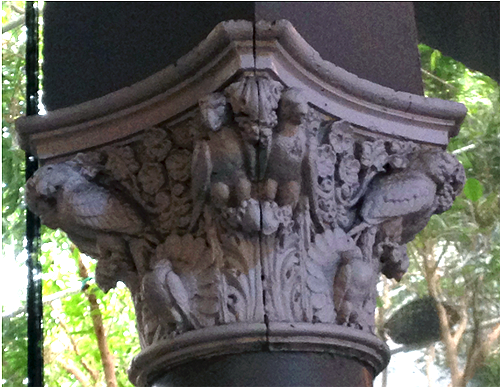 It was so unusual seeing birds set up in an old Victorian style building and they have really made an attraction of it. 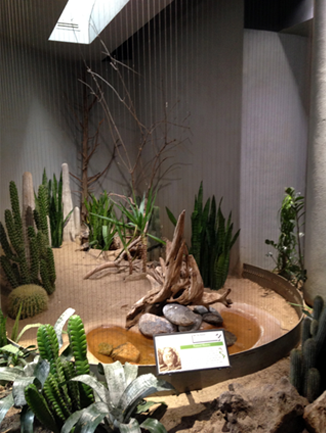 The collection houses 8,000 individuals over 250 species. As you went into this building there were birds that were generally the less audibly offensive species, the quieter birds are all housed within this facility. There were dozens of people at a time just coming through the door wanting to see these birds and it was a really great way to show them off and make them something really worthwhile visiting. 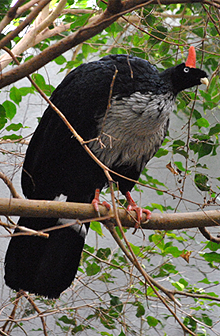 the Horned Guan (Oreophasis derbianus) which is critically endangered in its wild highland forest habits of south eastern Mexico and Guatemala. It is a very unusual big turkey sized species and they are certainly plugging the research for this bird species in the wild. 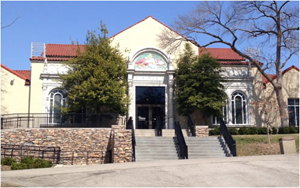 The photo on the right shows the building from the outside. It was built in the 1930s. Most of these old buildings were funded by the World Fair when they were just as popular as the Olympics back in the day, so there's quite a few nice older style buildings that they occasionally refurbish and swap species around in them. Most of the birds are displayed behind piano wire 1.2cm to 2.5cm apart. So is not just the aviary mesh it is certainly just very fine wires. However they been converting over to "phantom" mesh which is very fine, almost like a steel shade cloth, that you can still see through quite well. It is not good for photos because your lens tends to focus on what is straight ahead of you and not through the wire, like you can with the piano wire. They are experimenting with the steel mesh for some of the more destructive birds. can see they have got different birds including Macaws incorporated into it as well. 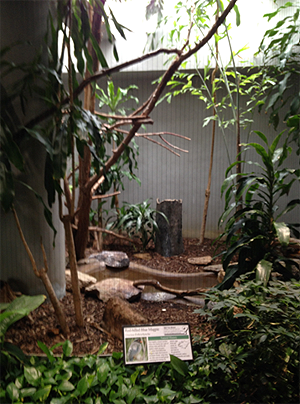 The photo (right) is an example of their well planted aviaries. 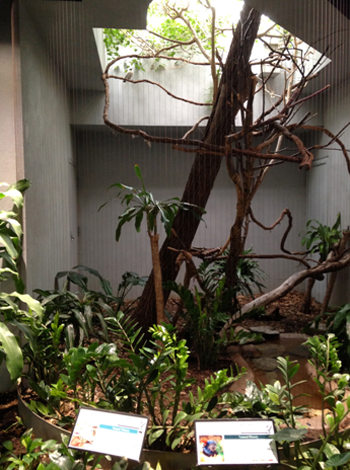 This aviary houses one of the South American Cuckoo species. The plant species are quite well selected. There is not a whole lot of UV light. 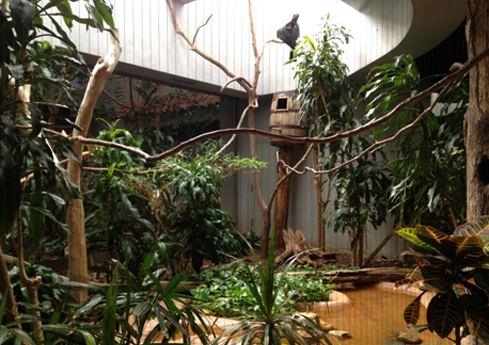 There is UV light coming in unfiltered through specific glass windows above each aviary. However they are limited to lower storey and certainly undergrowth plants. They are experimenting now with plastic plants as well because I guess as technology comes along with artificial plants there is really not much of a difference and you can quite easily fool the visitor/viewer as to what's real and what's not. 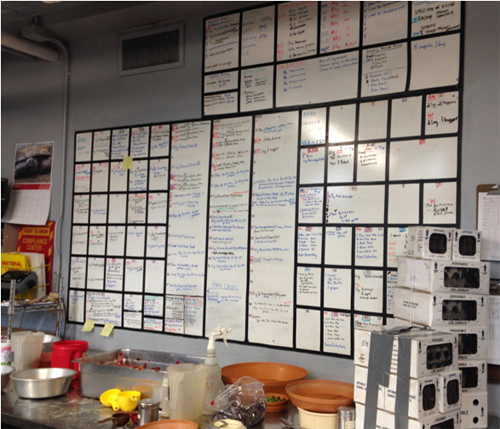 The photo (below) is their food preparation room. I am from a bit of zoo background myself and so it certainly helped me out a lot. I was very impressed. As soon as I got back to Sydney I introduced it to Symbio Wildlife Park. There is a big white board so if any of the zoo keepers, whether they on a casual basis or not, they can walk in and say - okay, this aviary here will need 3 dishes of fruit and this one will need 3 dishes of seed, etc. It was really well set up for the large casual roster of keepers that they have there. 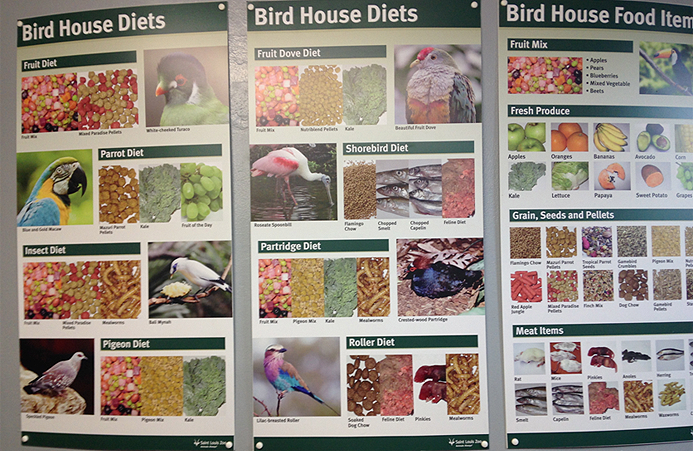 Although you can't really see them very well in the photo they have all the diet stats there and they incorporate a very broad range of different food items because they keep such a vast amount of different types of bird species. 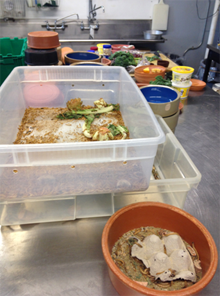 The following photo shows some of the various diets and food items that are required for the birds. It certainly kept me entertained for a few minutes. One of the things that really got me was the 45 Anole lizards. Anoles are something like a cross between a gecko and a chameleon. They are found in the Americas. They have this beautiful little throat flap that they use to display. They need the Anole lizards for a particular bird species such as some of the Hornbills. They are a really good breeding trigger if you feed them these little lizards. Whether they are alive or not, I am not sure but America doesn't seem too phased about the whole live bird group feeding to another live bird group so I didn't get a chance to find out the facts about the Anole lizards but more than likely they are wild collected as opposed to purpose bred. It is something I would like to look into. I didn't see the Anole lizards being fed out but I am quite interested in maybe incorporating feeding Asian house geckos that are pest in Queensland as package up frozen packs to birds. It is something that we can do to help with breeding birds and at the same time assist in cleaning up our environment in relation to an introduced pest. It might be something that is worthwhile looking into. They have a quarantine facility underneath the bird house. The quarantine facility has quite a few rows of aviaries that houses birds that are not on display. They use it if they want to rotate birds. It houses ingoing and outgoing birds and it also houses the Guam Kingfishers. I really like this idea that they have here; it is not nearly as intrusive as having to go inside each time to service the aviary. 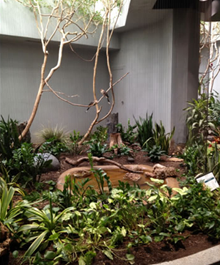 It is a brief little shelf made of mesh just inside those little squares that you can see in the front of the aviaries in the photo (above) that simply open up and you can service the food and water and that is all you need to do. You don't need to go inside disturbing birds which when you are dealing with birds like the Guam Kingfisher can make all the difference between the birds settling down and breeding that season. 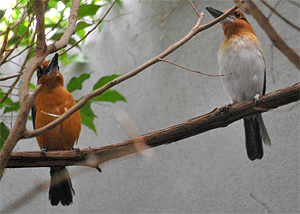 There are currently 137 Guam Kingfishers held in 11 facilities. St Louis Zoo has had them since 1985 and they have only recently gone on exhibit in 2010. They have had 47 hatch so that is a pretty decent rate but there is much more emphasis now on the breeding programme, more than there has ever been before. They are the rarest little bird that you will ever see and the rarest in their collection. The last Guam Kingfisher that was seen in the wild was in 1988. The Horned Guan is the size of a turkey. It looks like a kindergartener has just designed its face. It has this large bizzare red horn and white irises around the pupils of these large googly eyes. It is a very unusual looking bird. 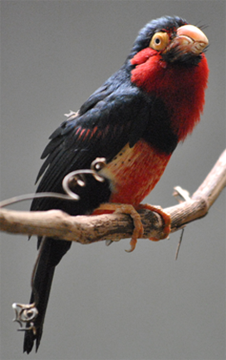 St Louis Zoo holds four of the six birds held in captivity. They have never bred them but there was one egg in incubation as of March earlier this year. They have a very intricate diet and they didn't go into it but they did say that a poor diet unfortunately leads to a high mortality rate in captivity. Certainly there are in situ programmes south of the border for these birds where they are trying to work on captive programmes prelease. However they were quite excited to have at least just that one egg in incubation. This is something that I certainly need to check on to see how they are going. This is another thing that fascinates me. You walk into the bird house and this is the first thing that you see. 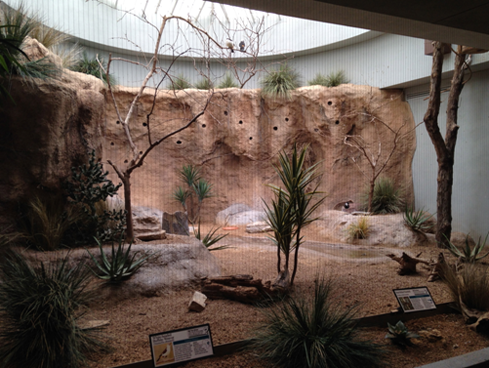 A big room set up, there is no wire so the birds are not behind mesh, they simply rely on the birds' behaviour to determine that they will remain in this room. You can't quite see the ceilings in the photo (above). It is above the tiles, it goes up about another metre or so with a group of people walking straight in or a group of kindergartens come running in, the birds aren't going to fly towards them, they are going to go back or shoot up. So they use the design of this structure to keep some of the more docile birds in there. Horned Guan, fruit doves, some of the whistling ducks and a few other species are all housed here. They do occasionally jump the barriers and wander around but the zoo keepers in the morning just chase them back over the barrier. You can at the back on the left there is a little bit of yellow plastic there, that is because there is some piano wire there and the yellow plastic is so that the Horned Guans don't crash into it. There is some nesting activity going on in there and they have had to separate it so that they don't get bothered by the other Guans. So hopefully there should be some other eggs by now. They were very excited about that news. This whole exhibit was fenced off with a darkened shade cloth so that there wasn't as much public interaction bothering the birds. The last time I visited the zoo this exhibit housed Victorian Crowned Pigeons. This time round it was Tawny Frogmouths. The American people love Tawny Frogmouths. 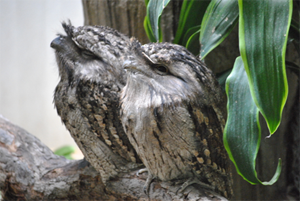 The last time I was there I asked the American keeper what her favourite bird was and she said she loved these Tawny Frogmouths. New stock was acquired from the Darling Downs Zoo in Queensland in 2013 and/or the South Australia Zoo to bring new blood into America and it was all over the news over there when they hatched a Tawny Frogmouth! St Louis Zoo is very proud to have bred Tawny Frogmouths. I love these owls. There was a whole family of these little Burrowing Owls. 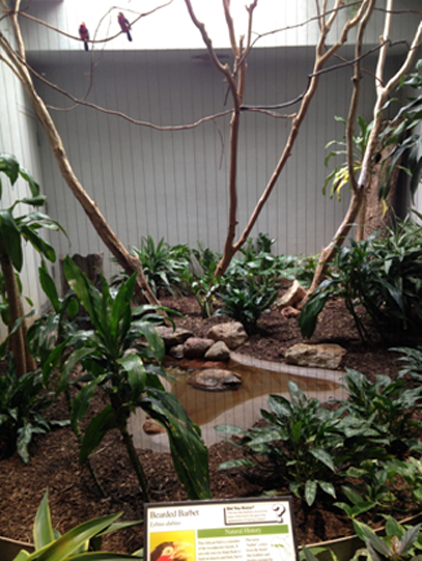 They had a beautifully landscaped exhibit. I guess they are not going to trash it like some of the noisy parrots would trash it. It was a very dynamic little exhibit. 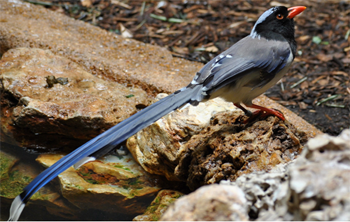 The Red Billed Blue Magpie is a beautiful little bird that softbill fanciers would love. It always looks like an animatronic in its behaviour, it posed for the camera, slow moving, it just stood there. It was fantastic for anyone who wants a good photo of a flash looking bird. It is almost too good to be true but I can tell you that photo does it absolutely no justice. It was such a brazen bird. It is something like (if anyone goes bird watching) and sees the Yellow Robins. They kind of just pose there for the camera and they are not phased by anything. The Red Billed Blue Magpie is a much bigger and more colourful bird than that. I loved this exhibit (below right). It was previously for Tinnamoos which is like a big quail (something like a partridge in an unattractive quail colour). This has now been re-landscaped with these holes, little pockets in the back of it. They are planning on introducing a large group of bee-eaters. Carmine Bee-eaters are quite common in American zoos whilst we have the Rainbow bee-eaters here in Australia. Amongst it is the Buffalo Weaver (below top left), a beautiful little weaver bird - a lovely little finch like bird. I couldn't get a good shot of them unfortunately. Then underneath it (below bottom left) is the Superb Starling which seemed to be like a filler species. 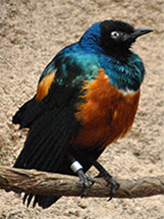 They couldn't think of something so the beautiful Superb Starling was put in this exhibit as well, much to my delight. They are an odd little bird. They have this Toucan-like thick beak. They are very colourful and are very well displayed. 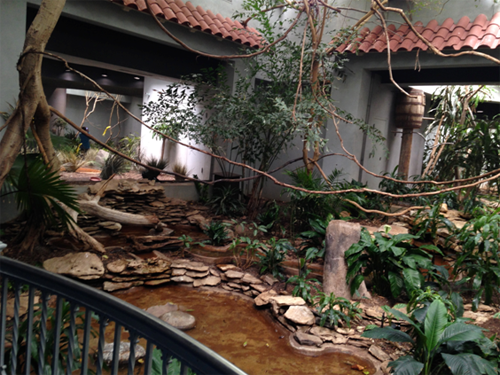 One thing that stood out for me regarding these aviaries was that they are almost like stages. Every one of them was like a theatrical stage. The light was directly in the middle, the perches are there in the middle, all your plants are creating the edges, and these birds knew just where to sit. It was clearly a method of providing all the necessities with the birds in the middle for public viewing. It was all really well thought out and the exhibits were excellent. I was snowing for a few days before my visit there and even during my visit there and this whole building is beautifully air-conditioned. Another beautiful bird, it is gigantic. The female is inside the great big wine barrel that you can see at the back of the exhibit (photo below right). The male is a beautiful bird, a massive bird, I got some great shots of him flying towards me. I would love to see them in kept in this country, just a couple of litte hornbills and some toucans please? I don't think it is going to happen in my lifetime. The Bali Mynahs. Another favourite bird of mine that I would love to see here in Australia. 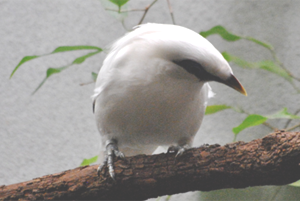 I would love to replace all the brown and yellow Indian Mynahs for the Bali Mynahs. It is a lovely white bird with a massive elaborate crest that it displays as part of the breeding behaviour. It was lovely to see (right in front of me). Again my photos don't do it any justice no matter how hard I tried. The Toco Toucans (photo below left). There were a few Toucan species. All of them for an Aussie were fascinating to just stand there and watch them for a while. As you leave the bird house there is a large alley of more piano wire exhibits (photo above right). They were fairly basic with just a couple of sturdy plants at the bottom and some perches in them. 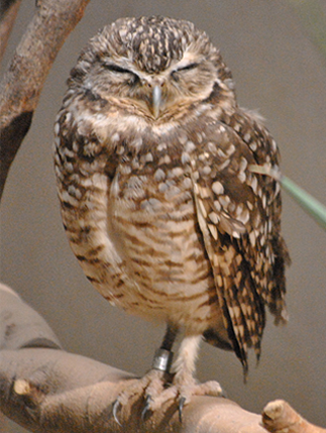 These generally house things like a lot of the raptors so there was a few owl species, there were screamers, trumpeters; these are all kind of large gamey type of birds that you find in South America so a lot of them were brought in. My previous visit was in the summertime so all these raptors and large gamey type of birds were outdoors then; so clearly these exhibits are about bringing the most temperature sensitive birds inside during the winter. Also amongst the birds was the Great Hornbill. It was a very inquisitive bird. It was probably more fascinated by the visitors watching it than they were of it. He was sitting there tilting its head and picking up its fruit and rocks and things and coming right to the front of the aviary. He was such a beautiful big bird. A very unique looking bird with a whole range of different fluoro looking colours on its face (photo below left). The tree trunk probably needs a good scrubbing, but it is certainly an impressive bird species to have in your collection. The birds in the photos below are I guess what you would call all the backup species that I got excited over. A lot of these birds are either in outdoor aviaries or in a mixed species exhibit with antelope and other hoofed stock. The Cabot's Tragopan is a pheasant-like species. It is quite a rare bird and they had a few of them there. The male has a very elaborate display. He extends all the fluoro skin around his face. The Penguin house was easily the most popular exhibit in the zoo (especially in the summertime when the temperatures hit 40o Celsius). There is a 2 hour line up in the summertime sometimes just to get into the penguin house. The Penguin house houses Rockhoppers, Magellanics, Gentoo and King Penguins, Common and Tufted Puffins, but most excitingly for me (because I love waterfowl and species like that), the King Eider - a beautiful colourful duck and they had just this one male. Phillip was calling all the people over to see the Tufted Puffins and Rockhoppers, etc., but I was fascinated by this one duck. The penguins had access to two large pools. You walked between these two pools, you could pat the penguins if you wanted to, and I don't know about you but I would love to pat a King Penguin. I would pay money for it, but you know what? In Saint Louis Zoo it is free! Everything in the zoo is free which is really, really amazing, and the city takes a lot of pride in this zoo and supports them. The Gentoos can jump onto walkways and the keepers get in their early in the morning and chase them back again. They won't do it while the people are there. The water temperatures in the pools must be maintained at 45o Fahrenheit/7.2o Celsius and that is the upper limit for what these penguins can tolerate. I asked about Emperor Penguins at the St Diego Zoo, which is the only facility that holds these big guys in captivity; and they must be kept at 35o Fahrenheit/-3.8o Celsius!!! Very, very chilly!!! The pool floors are painted in very dark tones. Now that was quite interesting. I heard a passing comment regarding the seal pool that they have discovered that seals often get eye problems from having beautiful artificial fluoro blue pools; but if you paint them À la natural ocean, they are not getting the reflection back into their eyes as they are swimming around. These photos (above) are inside the Penguin house. You can see the timber ramp in the photo (top left). I have some really good video footage that I was unable to incorporate in this presentation tonight and I am not going to impersonate penguin calls; but trust me - it was very noisy in there, it is really cold, really nice, you've got little fat penguins like the one in the photo (bottom left) posing in front of you. So two thumbs up from me, as a visitor I love this kind of thing. Then as you walk through there is my lovely duck, the King Eider (below top right). I just stood there for about 20mins ignoring everything else and just taking photos of him. There are only two King Eiders in captivity in the zoo industry over there and it is private keepers that have the rest of them; and so the zoos are constantly harassing these duck breeders, but they won't part with the females because they are not getting anything out of the zoos. I suggested they give them something out of their private collection and the keepers are going to give you all the hen birds you are ever going to need. 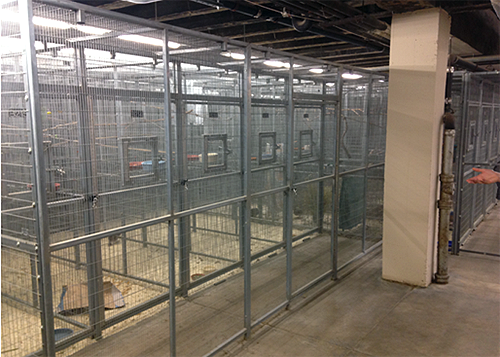 The photos (above) are a good representation of the Puffin enclosures. Large fake rocks, it is completely covered in, at the bottom left are some common Puffins and bottom left you have some Tufted Puffins which are a darker species but just as beautiful. To generate this beautiful big Penguin house there is a team of four technicians on daily staff just to run around and check temperatures and turn pipes, etc. Each coloured pipe serves a different purpose. Some are intake and some are outtake, some are different pools, some are UV sterilisation. It kills all bacteria so it is completely sterile in this big Penguin house. It filters 20,000+ gallons of water per minute (75,708 litres per minute). 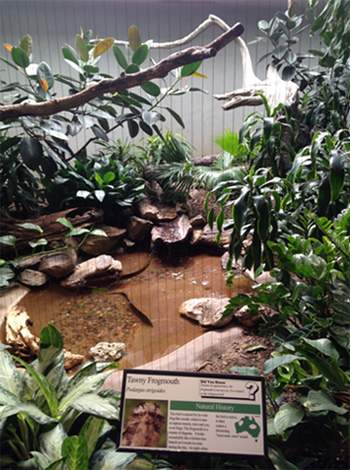 It is probably one of St Louis Zoo's more expensive exhibits to run. While we are getting our little VIP tour around the Penguin house we get to meet some PR penguins. These penguins don't go into the colony, they stay in a back room living up their life with their own pool and special care because if a baseball star or TV celebrity comes to visit St Louis Zoo out come the PR penguins. They get a big hug, they have been hand raised and think it is alright and then they go back to their own private room and they don't have to mix with the commoner penguins. They have a pretty good life. They get walked around daily and they get the top notch diets. Just to give you some idea of the backup generators required - there are four of these generators. They walk the penguins out of the zoo, around the block, and back. They may take place at 1:00pm and the people are lined up three hours beforehand to get up close to the penguins, touch the penguins, maybe get bitten by the penguins and maybe take a photo. The public love it! The whole colony of penguins goes out for a walk, walked around by their keepers. This happens when the temperature 40o Fahrenheit (4.4o Celsius) or lower. As I said, the people love it and the penguins enjoy the exercise. There was one summertime when the temperatures hit about 36o Celsius plus! There was a blackout and the generators failed and everyone was panicking. Then one very cluey keeper rang up the local pub, the local bottle shops, rang up the local Walmarts and asked them if they could bring out all their ice trucks and all their ice cubes. All these people pulled together and brought out all their refrigerator trucks, loaded all the penguins into them for a few hours and the penguins just remained in these trucks surrounded by ice cubes until the generators were fixed and they were moved back into their pool out of the sweltering heat. I really, really loved this story and it just shows that the whole city loves their zoo and chips in for them. This final photo is an American White Pelican. I had no idea they had these beautiful big growths on their beak. I had never seen that before. Obviously the Aussie pelicans don't have that. It just looked so prehistoric to me. It seemed to me that each pelican I came across discovered there got more eccentric with its growths on its beak so the photo below is one of the last photographs that I took. It was certainly beautiful and unusual. Thank you for listening and I hope you enjoyed my presentation on the St Louis Bird House. Note: Wikipedia, the free encyclopedia - "During the breeding season, both males and females develop a pronounced bump on the top of their large beaks. This conspicuous growth is shed by the end of the breeding season."